The government plans to roll out multi-billion projects within the next four years in its quest to implement its BIG 4 AGENDA. In an exclusive article done by The Star on Friday, the 2019 Draft Budget Policy Statement proposes to spend Sh5.6 trillion in financial years 2019/20 – 2021/22. On housing, Kenyatta intends to construct 500,000 homes in five lots in four years. Phase one will see 1,640 units built at Park Road, Makongeni (20,000), Shauri Moyo (5,300), Starehe (3,500) and Mavoko (5,500). Jubilee plans to build 15,000 units by empowering housing associations, 48,000 by counties, and 78,700 by Nairobi and Mombasa counties. In phase two, counties should put up 45,000 units, Nairobi regeneration (20,000), police (10,000), and 20,000 others at the NSSF land in Mavoko. Private developers will be encouraged via incentives to put up 20,000 units in the same period. Counties are further expected to construct 45,000 units in the third phase while 20,000 more through redevelopment of Nairobi’s old estates. The government targets 10,000 units under the Police Housing Plan, 20,000 at the NSSF Mavoko land; 10,000 by cooperatives, and 20,000 by private developers. Other 220,000 units will be put up in the fourth and fifth phase through cooperatives, private developers, and redevelopment of Nairobi’s old estates. A deal between the government and the United Nations Office for Project Services (UNOP) should deliver 100,000 affordable units. Gatundu South MP Moses Kuria on February 1 said he was pessimistic the project is achievable. "To build 500,000 houses within the 42 months left, we need to build 11,905 houses per month from today going forward," the legislator said. To actualise the ambitious plan, the government established the Kenya Mortgage Refinance Company (KMRC) to resolve funding constraints. The government has also set up the National Housing Development Fund which will mobilise capital for the affordable housing project. The infrastructure sector has been allocated Sh411.3 billion, Sh417.3 billion and Sh424.3 billion for the three financial years. Part of the money will be spent to construct of 8,245 km of roads, 150 bridges, rehabilitate 763km of roads, and maintain others stretching over 114,000 kilometres. The government also plans to complete laying the optic fibre, Konza Complex, and build roads at Konza Technopolis. Treasury CS Henry Rotich says the ministry has cut the budget to lower-priority areas. “To improve efficiency of public investments, we froze initiation of new capital projects until the ongoing ones are complete,” Rotich said in the policy statement. 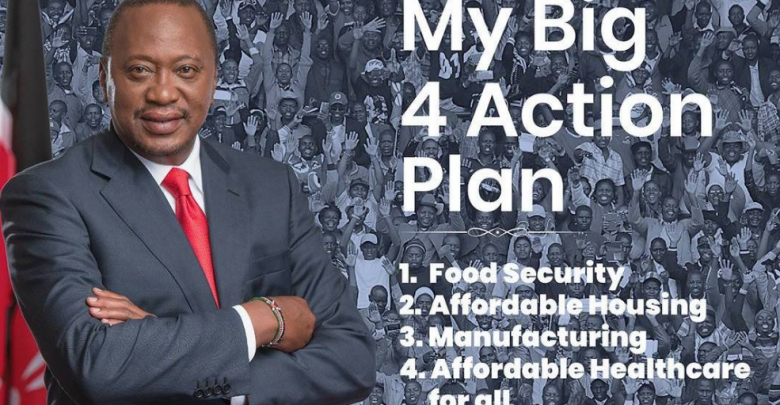 Kenyatta’s administration has also prioritised provision of Universal Health Coverage (UHC) to all. The scheme is at pilot stage in Machakos, Nyeri, Isiolo and Kisumu. “In order to implement the programmes, the health sector has been allocated Sh93.0 billion, Sh96.0 billion and Sh99.2billion for the financial years 2019/2020, 2020/2021, and 2021/2022 respectively,” the budget plan reads in part. The state targets the Linda Mama initiative, subsidies for the poor, elderly and vulnerable groups, persons with mental illness, secondary school students and the informal sector. Health infrastructure will be expanded to include specialised equipment and laboratories. Education will take the lion’s share of the budget as Kenyatta seeks to recruit teachers to support the 100 per cent transition from class to Form One. Education has been allocated Sh473.7 billion, Sh492.5 billion and Sh503.98 billion for the three financial years ending 2022. The monies will be spent on Free Primary Education and Free Day Secondary Education through increased capitation. The government seeks to continue supporting the special needs education and provision of examination fees for all students writing KCPE and KCSE exams. “The sector will also complete the ongoing construction and equipment of technical training institutes and support university education in public and private universities,” the policy statement states. The National Treasury is currently conducting pre-budgeting hearings on the 2019/20 budget in line with requirements for public participation. Agriculture, a key pillar of the Big Four, has been allocated Sh56.6 billion, Sh59.1 billion and Sh61.2 billion in the said period. The sector will focus on land management, livestock development, increased agricultural productivity, food security and income, blue economy, increased water storage capacity for irrigation, and improved agricultural research. For rapid industrialisation under the manufacturing pillar, Uhuru plans to acquire equipment and machinery for the New KCC, expand dairy processing plants. The government also plans to improve the ease of doing business, acquire the regional Anti-Counterfeit Agency exhibit warehouses, and establish the Commodities Exchange Platform. The government seeks to develop Kenanie Leather Industrial Park; complete the Ewaso Ng’iro tannery and leather factory, develop Athi River textile hub as well as construct industrial research laboratories in Kisumu and South B, Nairobi. The projects will be funded under the General Economics and Commerce Affairs sector at Sh23.9 billion, Sh25.5 billion and Sh26.3 billion in three years. The National Treasury has also allocated Sh272.1 billion for public administration, Sh200.8 billion for governance, law and order; and Sh146 billion for national security in the next financial year. The Jubilee administration is also planning to spend Sh82.46 billion to mitigate on matters environment, water and natural resources, and Sh52.8 billion on social protection.